Now, if I use the method found here but using rubidium hydroxide, or caesium hydroxide, will it work? Nurdrage could'nt get sodium hydroxide to work, so I asume it won't work using lithium hydroxide either. It will work. The only problem when working with Cs and Rb is to use inert atmosphere, avoid self ignition and also note that CsOH is a really strong base, it will eat the glass. 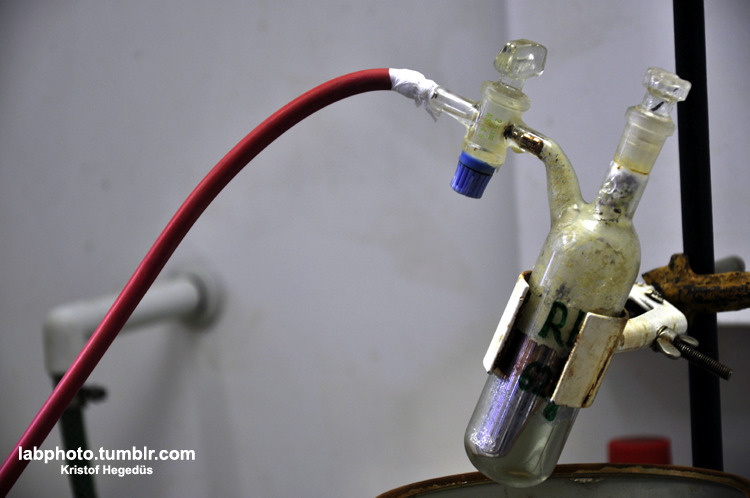 It would be much safer to turn CsOH and RbOH to their carbonates and make magic with that. Thanks! I didn't know I could use carbonates, would the Cs2CO3 and Mg method work with Rb2CO3? Also their carbonates are way cheaper. Could this be done using thier chlorides? Oddly enough, MgCl2 isn't favorable -- these methods depend on the stability of MgO (or Al2O3), both of which are remarkably robust. Would nitrates work? I have access to lots of caesium and rubidium nitrate, but I would obvioulsy prefer the elemental form. Does tert-butanol work as a catalyst for the carbonate method? Also I will need a solvent that caesium will float in to help it coalesce into a sphere, tetrahydronaphthalene isn't dense enough. I don't want to be rude, but it is highly recommended to start with something easier, like... Potassium? It could also easily ignite, it's an alkali and it's perfect to gather some experience. And no, starting from a nitrate won't work. Alkali metal isolation. Elements can't be chemically synthesized. Leaning the basics of chemistry before dealing with such dangerous substances is a must. Nope, synthesis is a correct term here. Isolation would indicate that the metal would already be at oxidation state (0) and just separated from something else. Actually the most accurate term would be analysis. In the early days of chemistry braking stuff down was called analysis and combining stuff was synthesis. Nowadays synthesis is however more widely used do describe the process of making new compounds/elements from other ones. For comparison, would the following then be the isolation of hydrogen: HCl + 2 Zn → ZnCl2 + H2? Isolation in the strictest sense would be removing a chemical element or chemical substance from a mixture, but in the broad sense can be used instead analysis. Rarely anyone uses the word "analysis" in its original meaning. Today, it's connected to quantitative and qualitative analysis and not preparative chemistry. Chemical elements can not be chemically synthesized. They can be synthesized in nuclear reactors which is a nuclear process. Chemical compounds are chemically synthesized, and chemical elements are chemically isolated from chemical compounds. Yes, the process behind the equation you've wrote would be isolation of hydrogen by oxidizing it using zinc as a reducer. It's a typical school example of hydrogen isolation by a redox process. I'll continue repeating this ad nauseam, every time I see someone making these grossly huge errors here. I can not believe people are dealing with incredibly dangerous substances under highly energetic conditions and having the lack of knowledge kids learn in elementary schools. Before the age of YouTube, I've never ever seen any professor talking about "synthesizing sodium". I've never read a single book talking about "synthesizing chlorine". Those were nonexistent phrases. I saw "making" and "producing", but not "synthesis". It's a disinformation, a bad meme that's spreading around because more and more uneducated people have opportunities to do amateur chemistry via Internet. I'm not saying that's a bad thing, of course. The more of them, the better, but proper information must be spread, and the bad information should be stopped and corrected. Synthesis has indeed become synonymous to "prepare" in some sense. It sounds odd to me as well to say "synthesis of hydrogen" or any other element for that matter. I'm not however very concerned with this synthesis business as there are terms which are much more often confused and lead to more serious problems in theoretical and experimental work. Such terms would include stereospecific, R/S/D/L/d/l/+/- and so forth. Interestingly enough IUPAC has not given a definition for synthesis. You are indeed very much spot on with the term isolation! I have been too busy with natural products chemistry and grown to forget the use of "isolation" when talking about elements. My bad! I would say that the previous equation was zinc chloride synthesis/metathesis with hydrogen byproduct. "the combining of the constituent elements of separate material or abstract entities into a single or unified entity"
"the forming or building of a more complex substance or compound from elements or simpler compounds"
" the separating of any material or abstract entity into its constituent elements"
It pretty much depends on what the target of the synthesis is. If for example a protecting group is removed from a delicate organic structure you combine the protecting group with the removal reagent. However no one in their right mind would call that a synthesis of Me3SiFOH with the original target as a side product. This is why I think it's not all that important to get too picky with when the word synthesis is applicable and just go with the flow. I have to agree with kavu: our poorly-controlled use of terms globally often leads to some seeming synonymous and others antonymous to one another. Indeed, for instance, is the electrolysis of water the synthesis of oxygen and hydrogen molecules - which 'weren't there' previously, or isolation as the elements cannot be chemically synthesised? Is this whole process 'analysis', as we are breaking down the water molecules? Perhaps someone should email IUPAC, asking for exact definitions. (Just like to announce, on this day 1 year ago, I joined sciencemadness.org, and have enjoyed every moment of activity here. I have learned so much and the knowledge gained is invaluable: thank you to you all). Isolation is the separation of one desired component from a mixture, wherein the target material already exists. Analysis isn't really an applicable term here, because we're talking preparatively. Extraction is another term that is similar to isolation, but can also mean the production of an element from an ore.
Saying this, I can also see why synthesis is a misleading term. However, obtention of an element from of the desired element-bearing material can also be classified as the "synthesis of element X". It might help to specify somewhat. Technically its a "chemical synthesis", as opposed to a "nuclear synthesis". I dont think synthesis should be restained to the adding of mass/atoms. "Preparation" is a much less ambiguous term. Sorry for saying synthesis, you all knew what I meant. Just so all of you know I do have many safety precautions, such as eyes and respiratory protection ,also a powder based fire extinguisher. I do think making potassium would be a good start, I won't be making any alkali metals until I get the right equipment. I've only gotten lithium from a battery once, and made sodium oxide. But I really do need a solvent that is highboiling and very dense (at least 2.00/ml) I'm pretty sure tert-butanol can be used as a catalyst for most reductions, but can we please focus on the isolation of alkali metals and not vocabulary? So there is magnesium reduction with a solvent and catalyst involved, this works for potassium, rubidium and caesium production. Also to make sodium you can mix magnesium powder and sodium hydroxide powder, and then light it inside a crusible. But what about lithium production? Molten lithium will attack glass, so even if the method outlined for potassium would work, it would have to be conducted in some other sort of vessel. Lithium will attack glass? Even boroscilicate glass? APO: have you consulted the 'sticky' potassium thread above? Great information on solvents for K production! I suppose you could convert you nitrate to a carbonate by mixing it with charcoal and igniting it. Some of your carbonate might be contained in the smoke. I would rather use carbonic acid to produce carbonates. I didn't look at the sticky thread so much because I had trouble finding dense solvents, can I get an example of a solvent at least twice as dense as water? I don't think carbonic acid is going to convert your nitrate into a carbonate.